13 Best Gifts for Nurses! What are the best gift ideas for a nurse? Nurses play a huge part in a patient’s life! They are the ones literally caring and nurturing a sick person. If you have a nurse in the family or a favorite nurse in the hospital and want to find a beautiful gift for her, stick around for a while! *This is a gorgeous Lladro porcelain nurse figurine for sale! It is very tall, at approximately 14.5 inches, and will make a wonderful gift idea for a nursing student or a professional nurse! It will be a great reminder of how much you love and care for her! Very cool gift idea for a nurse! 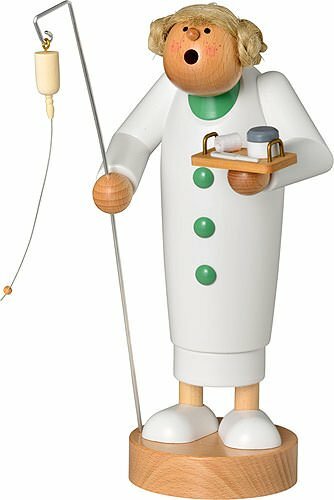 In my opinion nurse figurines and statues make perfect gifts for nurses! 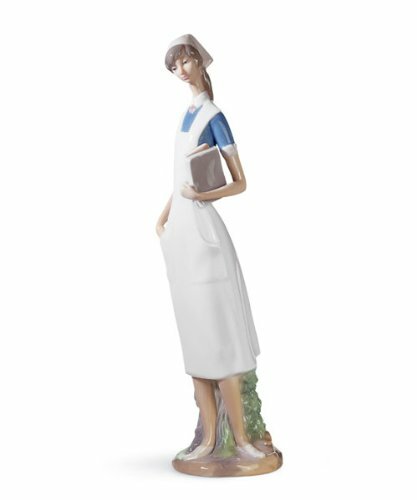 This one is more than just a cool nurse figurine! It’s also a cool incense smoker! All you have to do is put an incense cone inside the hollow body and the smoke will come out of the mouth! I had never seen one like this before! 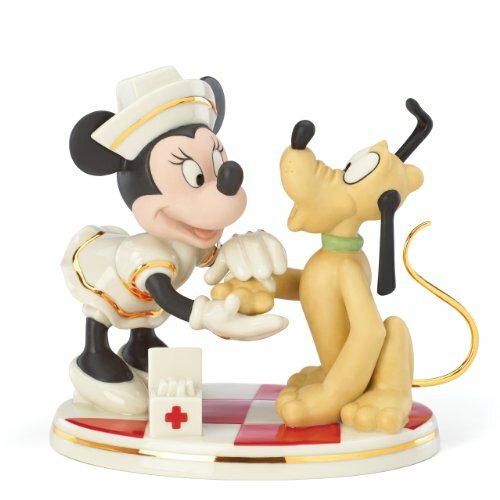 Adorable Minnie Mouse Nurse Figurine! Look who just graduated as a nurse! She looks so cute in her nurse outfit! Guess who is her very first patient? 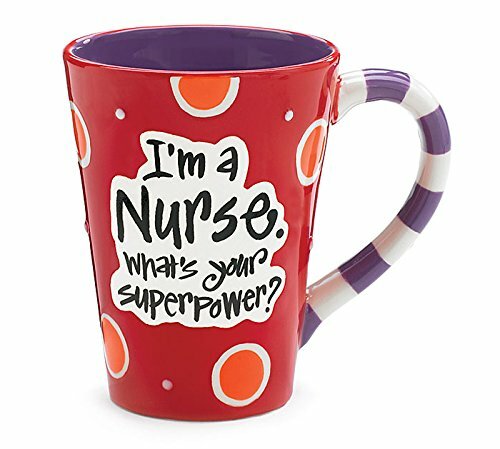 Nurse coffee mugs also make great gift ideas for nurses on any occasion, of course! This one is beyond cool! What a cute, fun and very creative gift idea for nurses!! It’s a cool nurse wall clock for sale! This is a beautiful book for nurses! 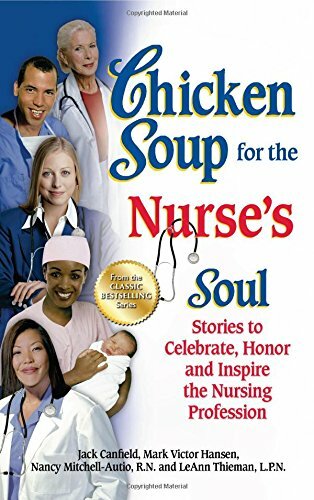 It’s full of inspiring stories about nursing! 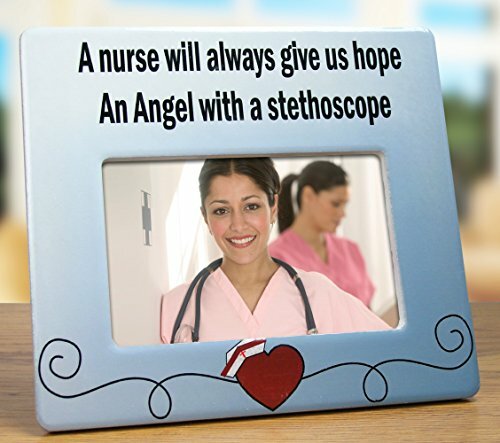 If you are looking for a beautiful and meaningful gift idea for a nurse, then look no further! 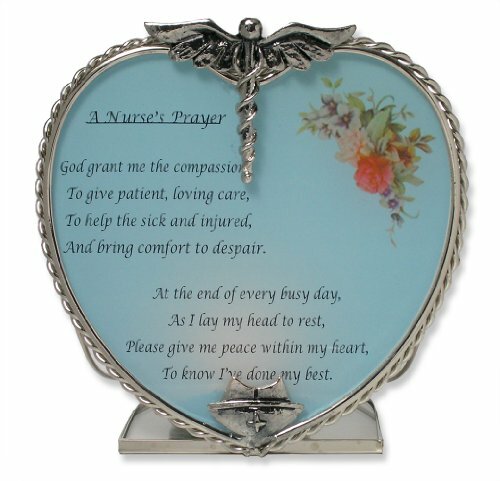 This is a beautiful and very touching heart-shaped nurse’s prayer candle holder for sale! Another great gift for nurses is this beautiful ceramic picture frame for sale! It holds any standard photo. 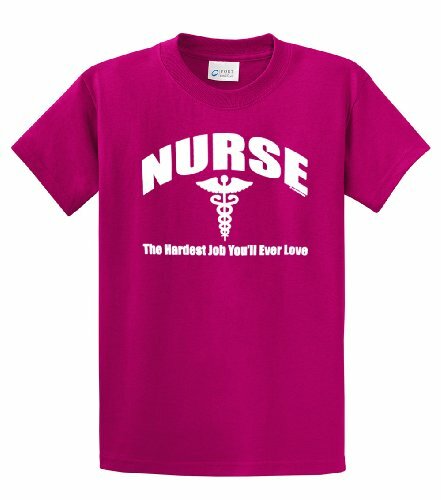 Cool Nurse T-Shirts The Hardest Job You Will Ever Love! How about giving a cool and very colorful NURSE t-shirt to your favorite nurse? It is perfect for either a male or female nurse! l also love the saying! Beautiful 14k Yellow Gold Registered Nurse Pendant Necklace for Sale! 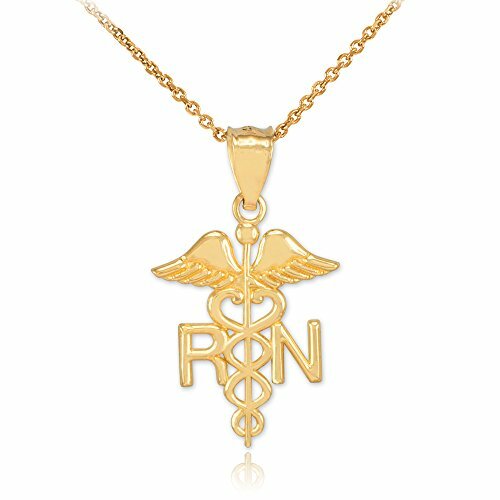 If you are looking for a beautiful and fancy birthday or Christmas gift idea for a nurse, how about this gorgeous yellow gold nurse necklace? It is a beautiful pendant with the letters “RN” and the caduceus symbol. 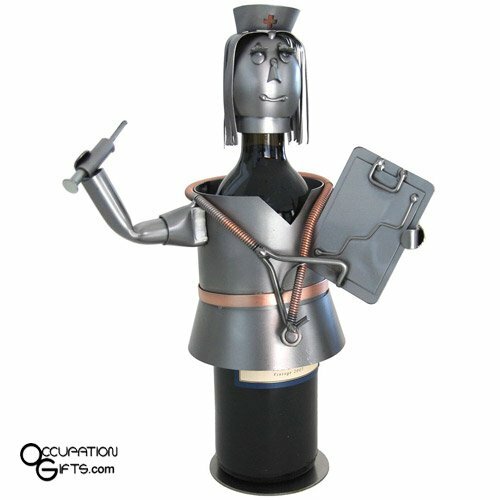 How about this amazing recycled metal nurse wine bottle holder for sale? It’s definitely one of the coolest gift ideas for nurses around! Very Cool Handpainted Nurse Wine Glass! 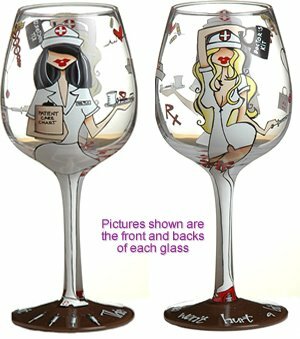 Another ultra-cool Christmas gift idea for a nurse is this gorgeous and very colorful hand-painted nurse wine glass for sale! *The picture shows the same glass, back and front. It also comes in a beautiful gift box! *I truly hope I have been able to help you here today find a cool gift idea for a nurse! Best Gifts for Medical Students! Best Gifts for a Dentist!